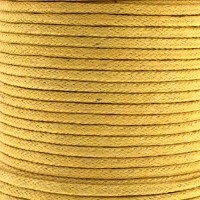 Waxed cotton cord is well suited for making jewellery and other crafts. The waxed or polished cotton cord is a great alternative to leather. It is also used for knotting, weaving, or lashing as it easily holds the knots or ties. It comes in a host of colours and diameters to accommodate any project at hand.